Home » Jennifer Lopez Picks Pumpkins With Her Twins! Jennifer Lopez was spotted taking her kids, Emme and Max Anthony, to Mr. Bones Pumpkin patch in Beverly Hills California on Saturday. In true LA style the singer arrived with an assistant and manager Benny Medina in a white convertible Bentley. At the patch Jennifer’s kids took advantage of all of the fun activities. 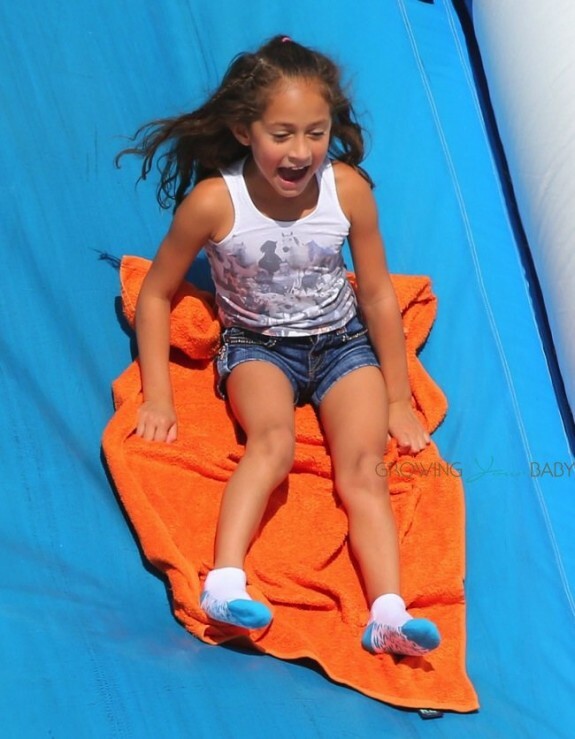 Emme was photographed going down the skeleton slide and riding the ponies. Before they left she also had her face painted. In January, Jennifer will return to American Idol for the 14th Season. Last week she was spotted with co-judges Harry Connick Jr., and Keith Urban shooting promos for the new season, and the trio is set to begin filming Hollywood Week on October 25. Also look for her on the big screen in the new year when The Boy Next Door hits theaters on January 23rd.